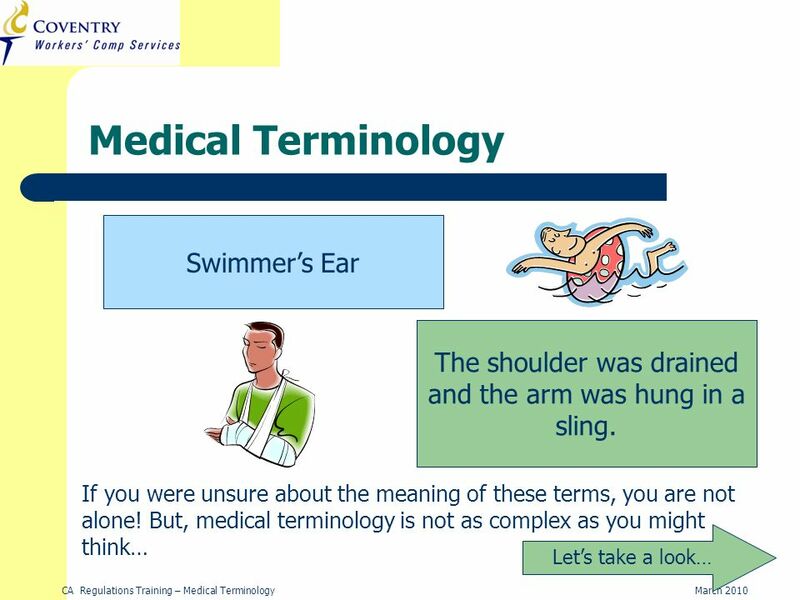 4 CA Regulations Training – Medical TerminologyMarch 2010 Medical Terminology is Everywhere You are probably familiar with a lot of different medical terminology just from the media. Magazine and newspaper articles are filled with information about new drugs, treatments, diets, and new medical procedures. 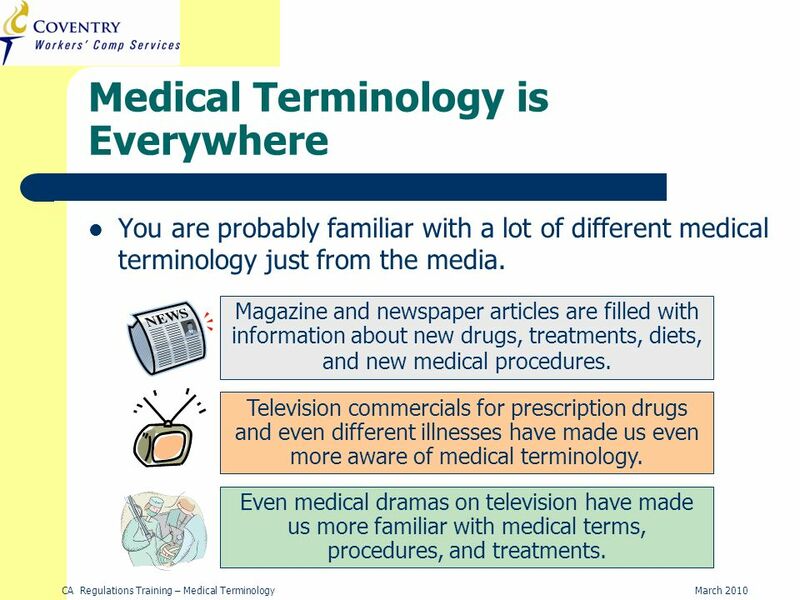 Television commercials for prescription drugs and even different illnesses have made us even more aware of medical terminology. 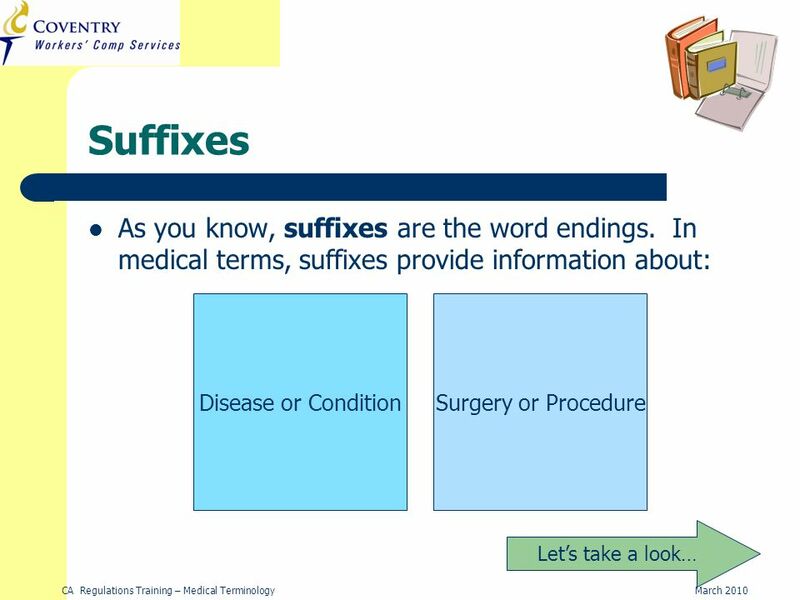 Even medical dramas on television have made us more familiar with medical terms, procedures, and treatments. 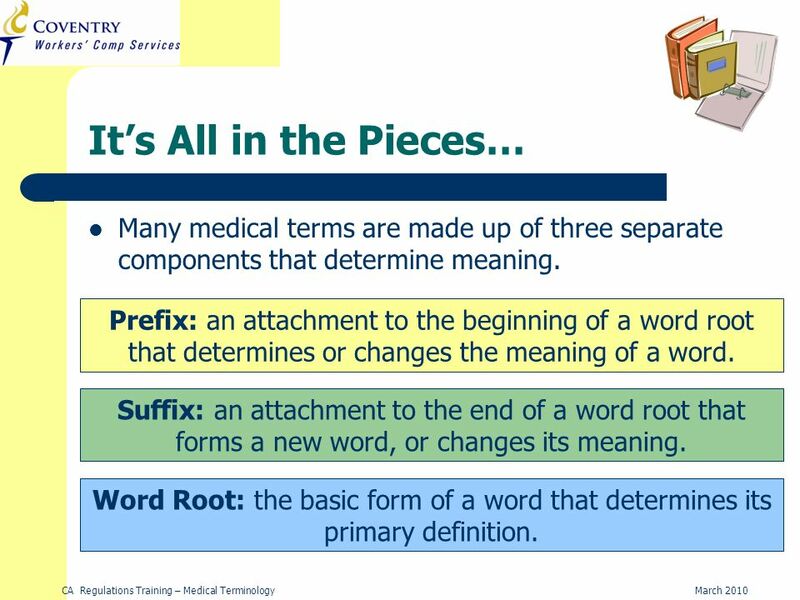 6 CA Regulations Training – Medical TerminologyMarch 2010 Its All in the Pieces… Many medical terms are made up of three separate components that determine meaning. 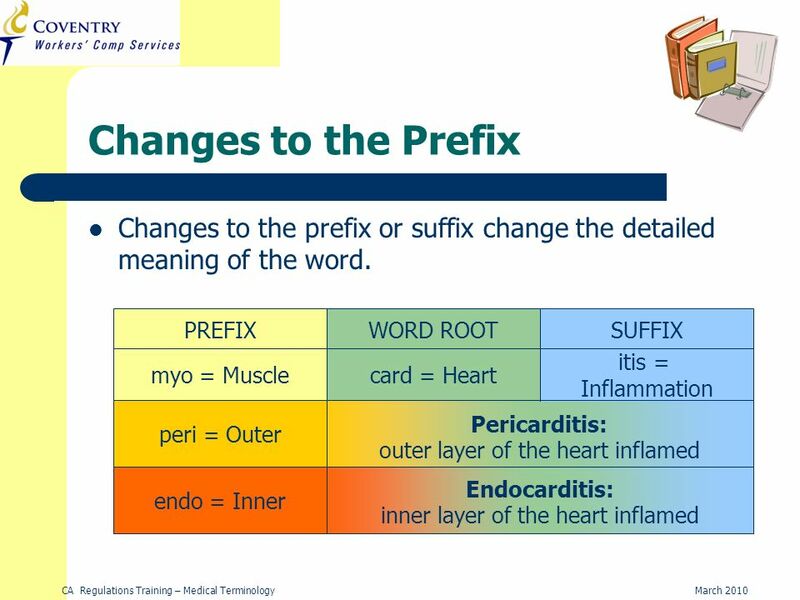 Prefix: an attachment to the beginning of a word root that determines or changes the meaning of a word. 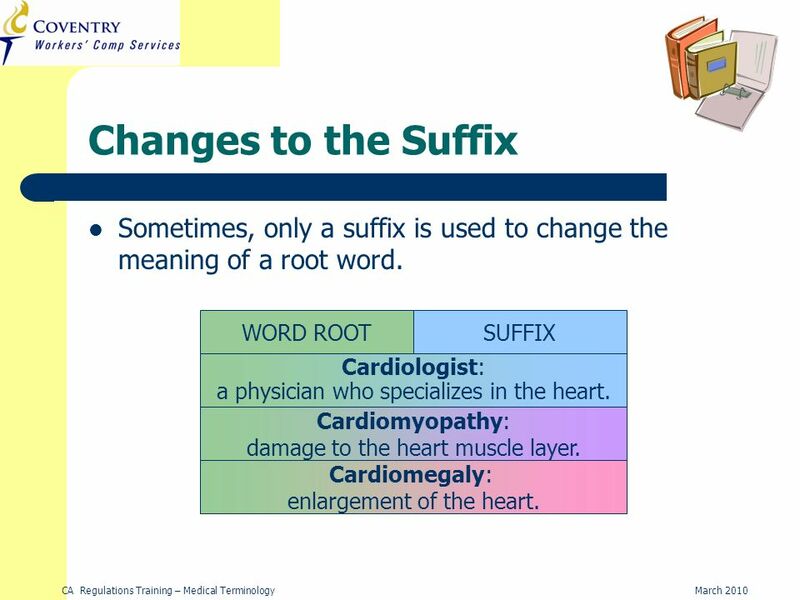 Suffix: an attachment to the end of a word root that forms a new word, or changes its meaning. 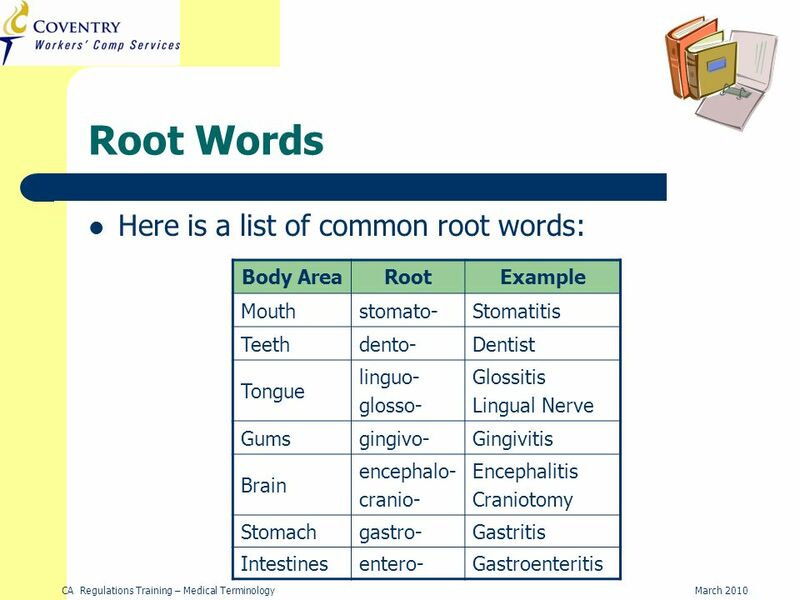 Word Root: the basic form of a word that determines its primary definition. 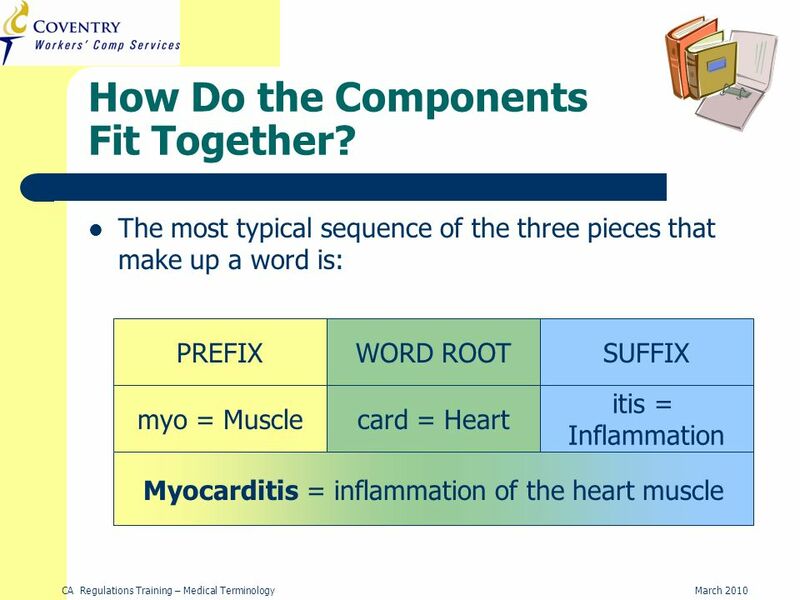 9 CA Regulations Training – Medical TerminologyMarch 2010 card = Heart Changes to the Suffix WORD ROOTSUFFIX -ologist card = Heart-myopathy Cardiomyopathy: damage to the heart muscle layer. Cardiologist: a physician who specializes in the heart. -megalycard = Heart Cardiomegaly: enlargement of the heart. Sometimes, only a suffix is used to change the meaning of a root word. 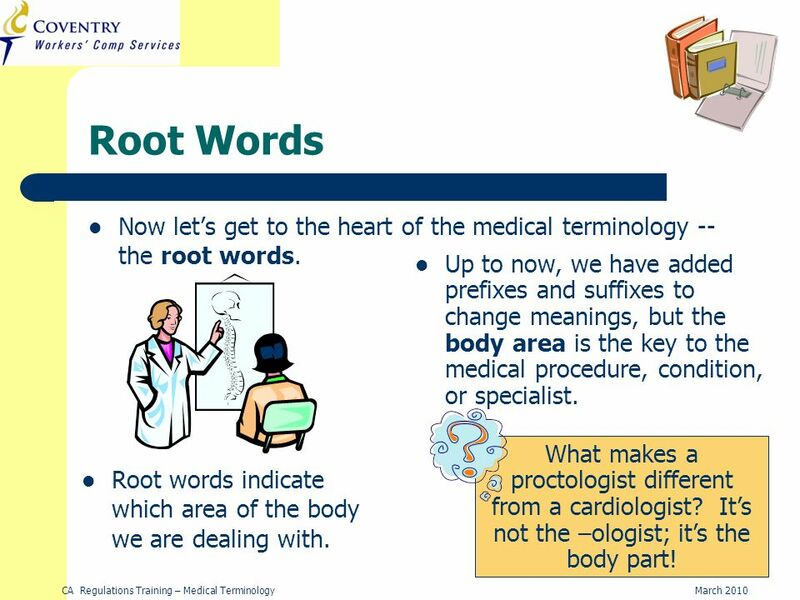 16 CA Regulations Training – Medical TerminologyMarch 2010 Root Words Now lets get to the heart of the medical terminology -- the root words. 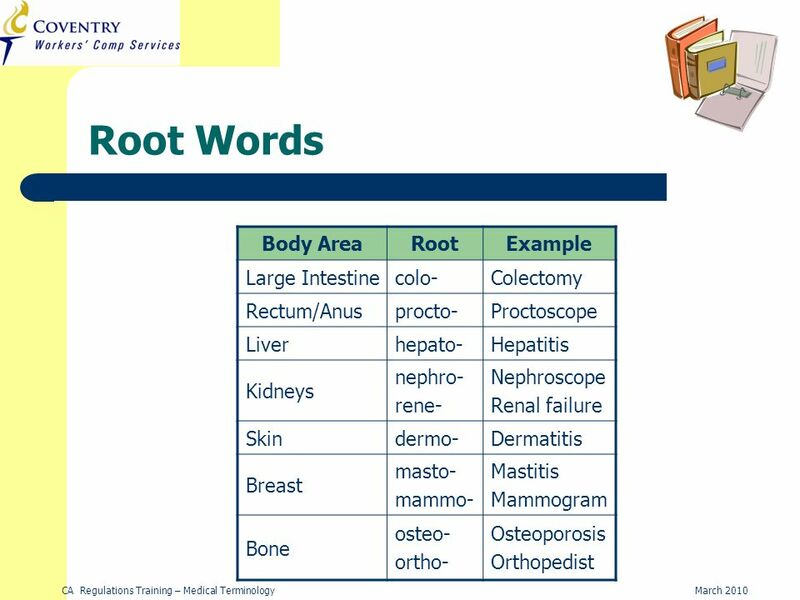 Root words indicate which area of the body we are dealing with. 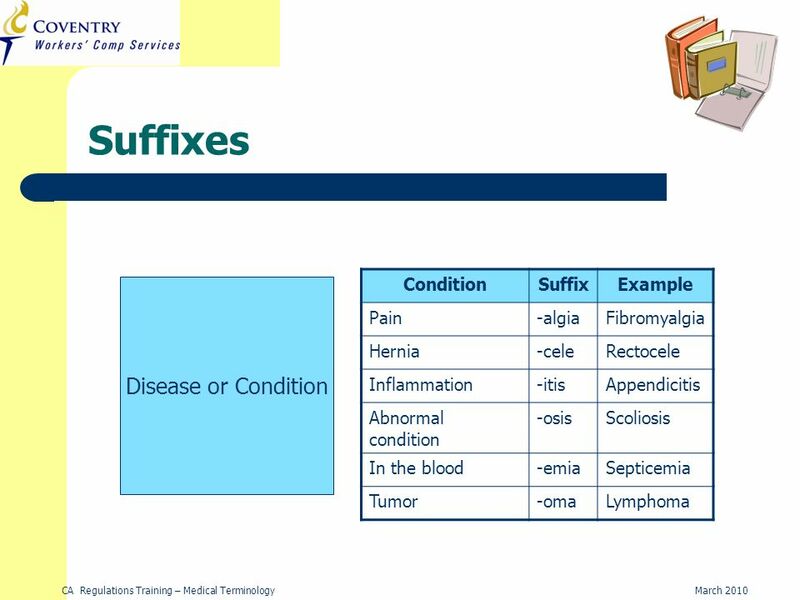 Up to now, we have added prefixes and suffixes to change meanings, but the body area is the key to the medical procedure, condition, or specialist. What makes a proctologist different from a cardiologist? Its not the –ologist; its the body part! 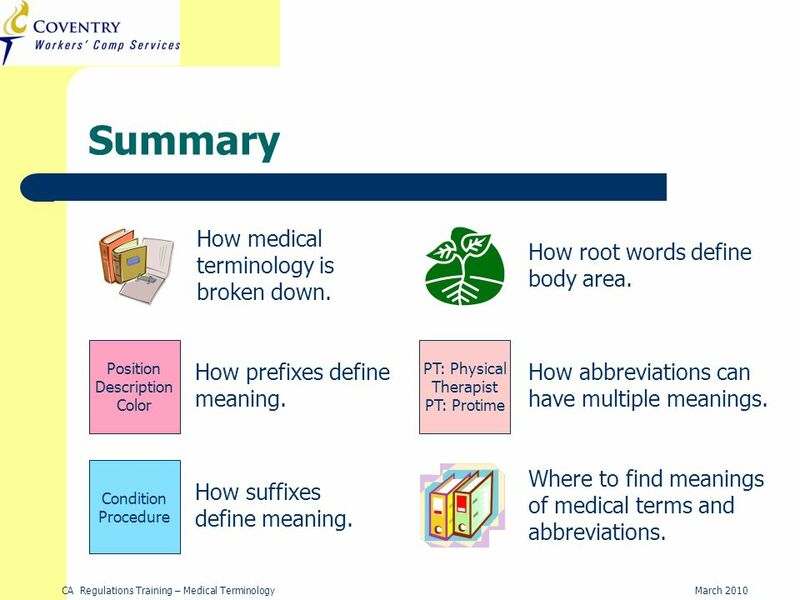 22 CA Regulations Training – Medical TerminologyMarch 2010 Abbreviations Next to the military, medicine probably has the second most enthusiastic users of abbreviations. 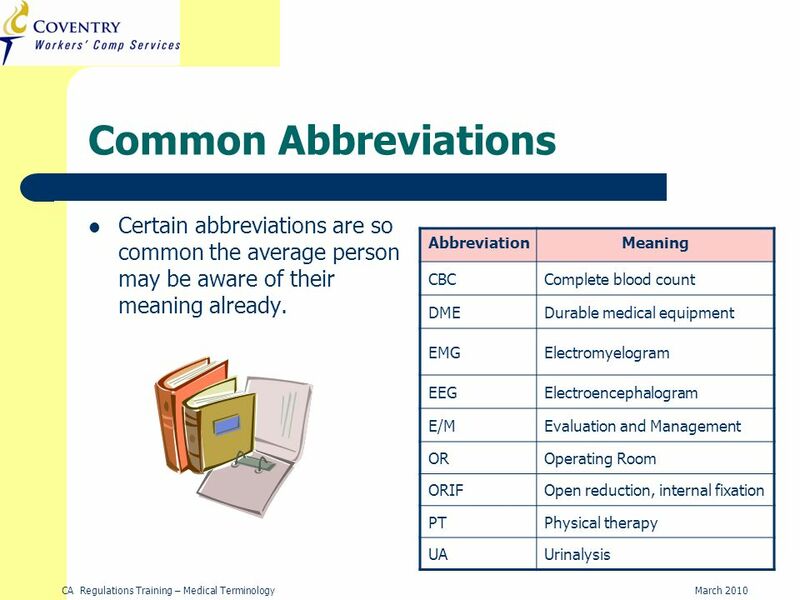 To make things complicated, the same abbreviation can mean something entirely different depending on the part of medicine that is being referred to. 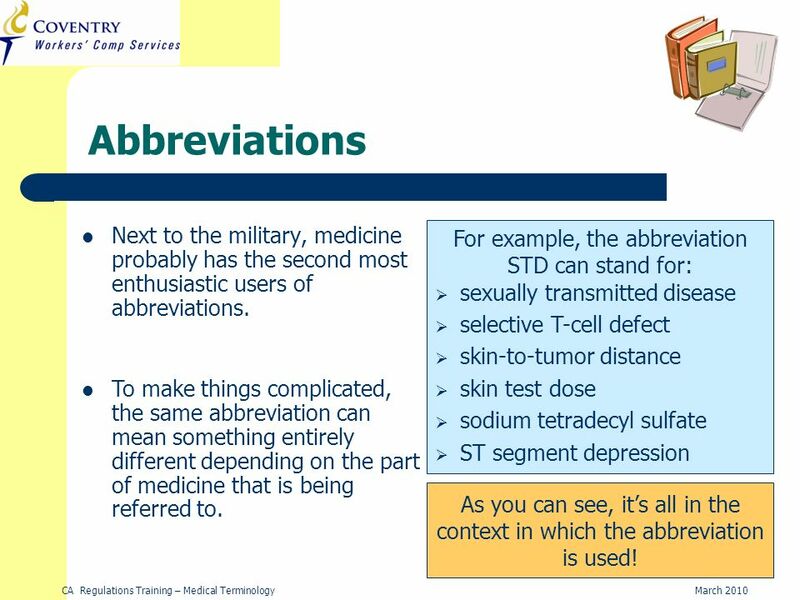 For example, the abbreviation STD can stand for: sexually transmitted disease selective T-cell defect skin-to-tumor distance skin test dose sodium tetradecyl sulfate ST segment depression As you can see, its all in the context in which the abbreviation is used! 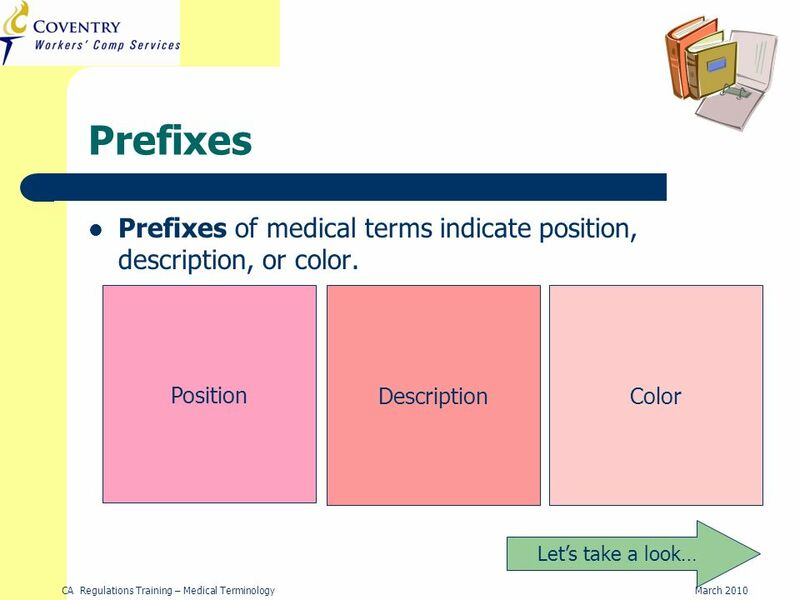 23 CA Regulations Training – Medical TerminologyMarch 2010 Abbreviations The context in which an abbreviation is used may give the reader a hint to meaning. 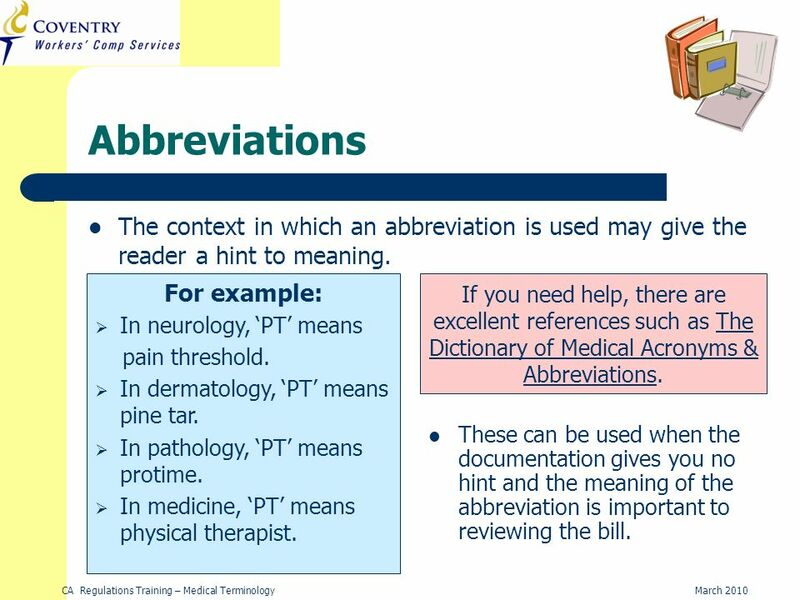 These can be used when the documentation gives you no hint and the meaning of the abbreviation is important to reviewing the bill. For example: In neurology, PT means pain threshold. In dermatology, PT means pine tar. In pathology, PT means protime. In medicine, PT means physical therapist. 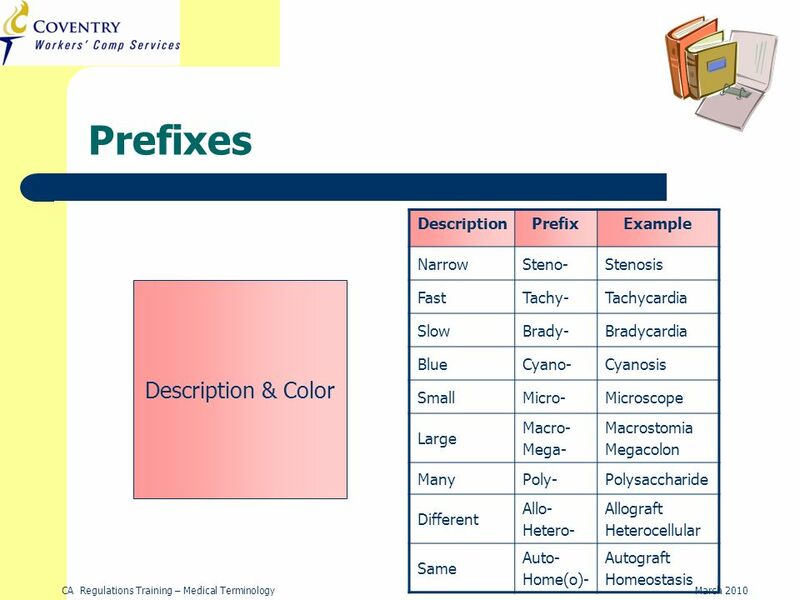 If you need help, there are excellent references such as The Dictionary of Medical Acronyms & Abbreviations. 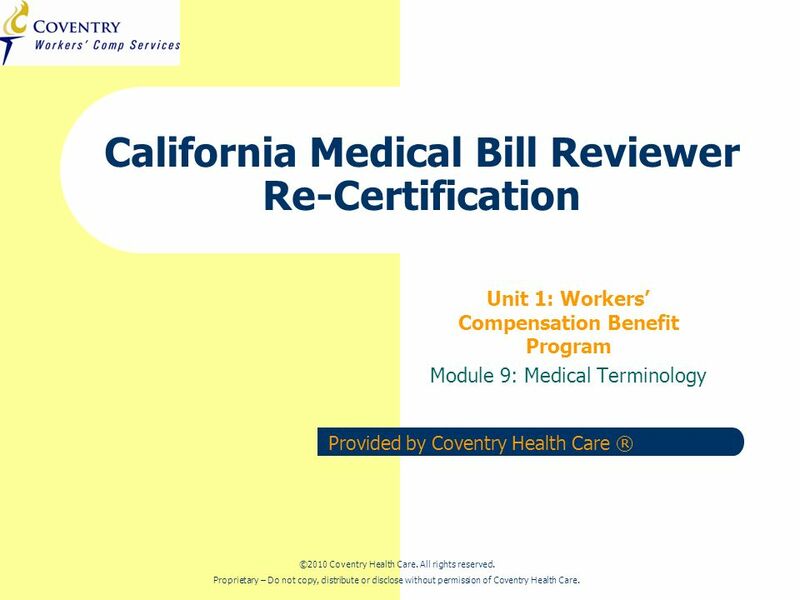 25 CA Regulations Training – Medical TerminologyMarch 2010 Abbreviations There are many other abbreviations, but you will become used to the ones you see all the time in your work. 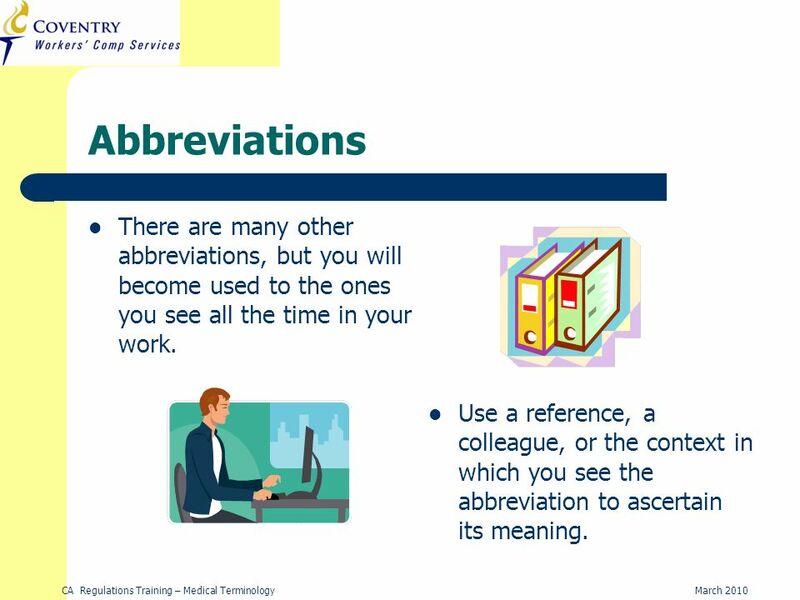 Use a reference, a colleague, or the context in which you see the abbreviation to ascertain its meaning. Download ppt "©2010 Coventry Health Care. All rights reserved. Proprietary – Do not copy, distribute or disclose without permission of Coventry Health Care. Provided." 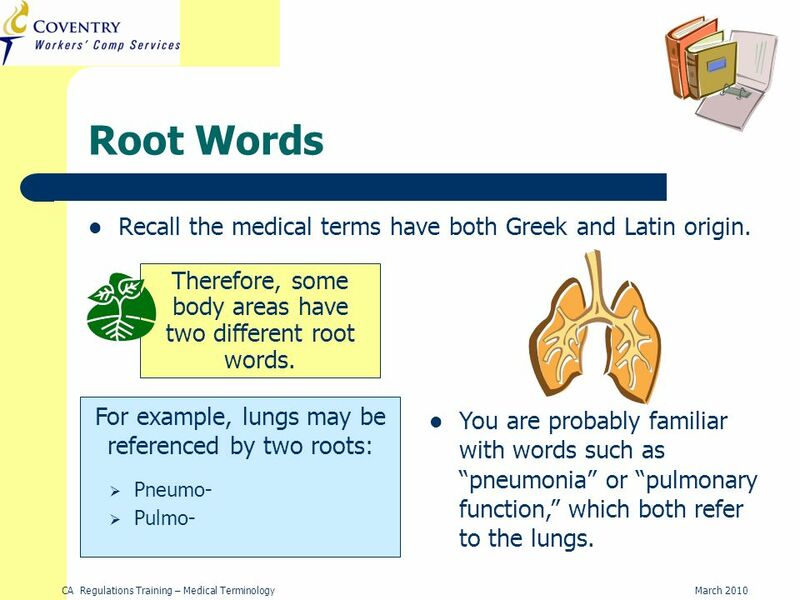 Medical Terminology A Language of its Own. A. Like a foreign language to most people B. Made of terms that describe the human body in detail C. Used to. 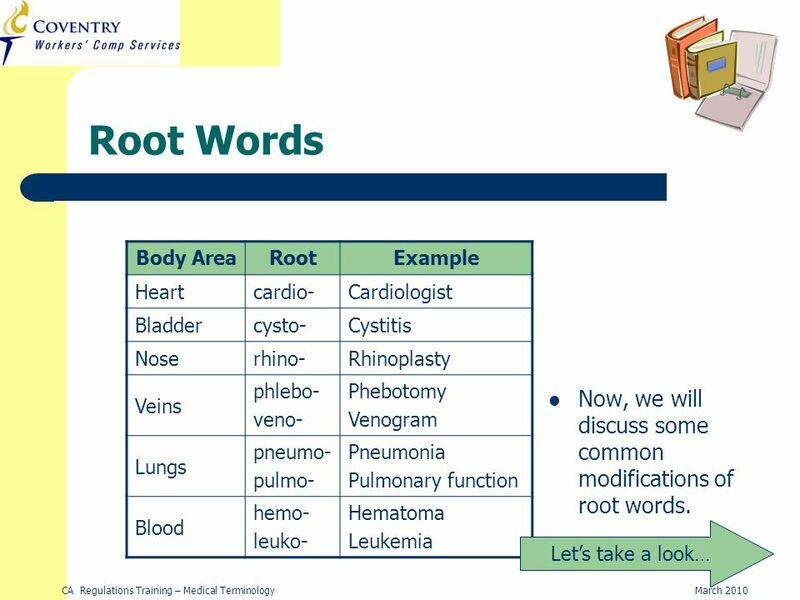 Chapter 1: Introduction to Medical Terminology If a word or phase is underlined, you will need to write it for your notes today!! 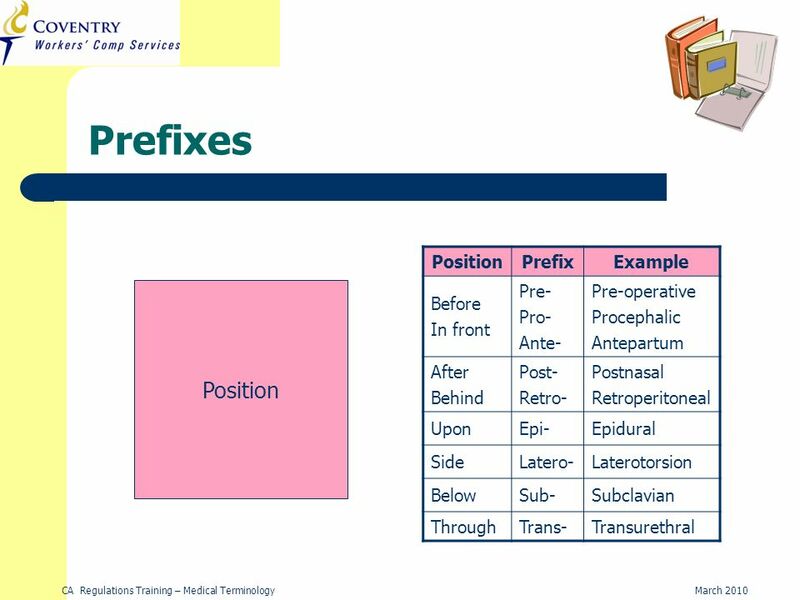 1 Learning Medical Terminology Recognizing the S tems/Prefixes/Suffixes Prepared by E. Phufas. 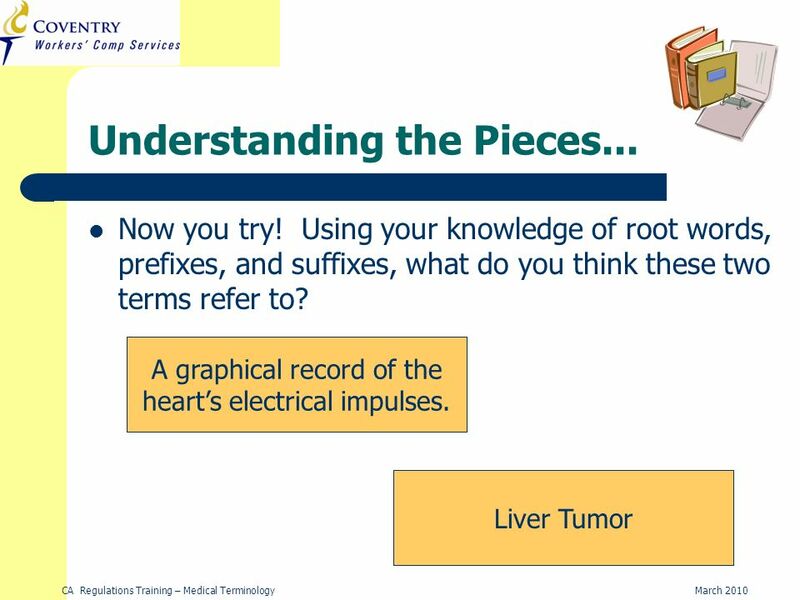 Medical Terminology Practice Let’s Get Started! Copyright © 2012, 2009, 2005, 2003, 1999, 1991 by Saunders, an imprint of Elsevier Inc. All rights reserved. 1 Basic Word Structure. 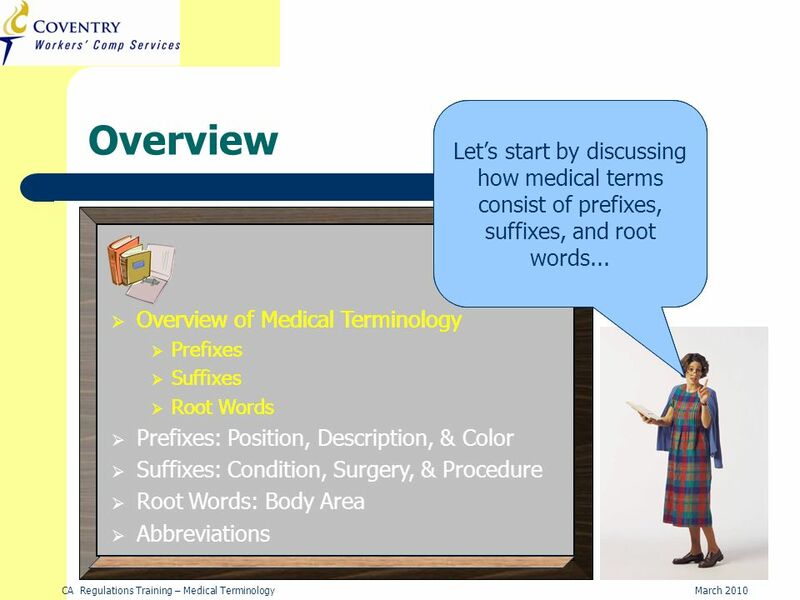 Medical Terminology Introduction Mrs. Elizabeth Keele, RN. 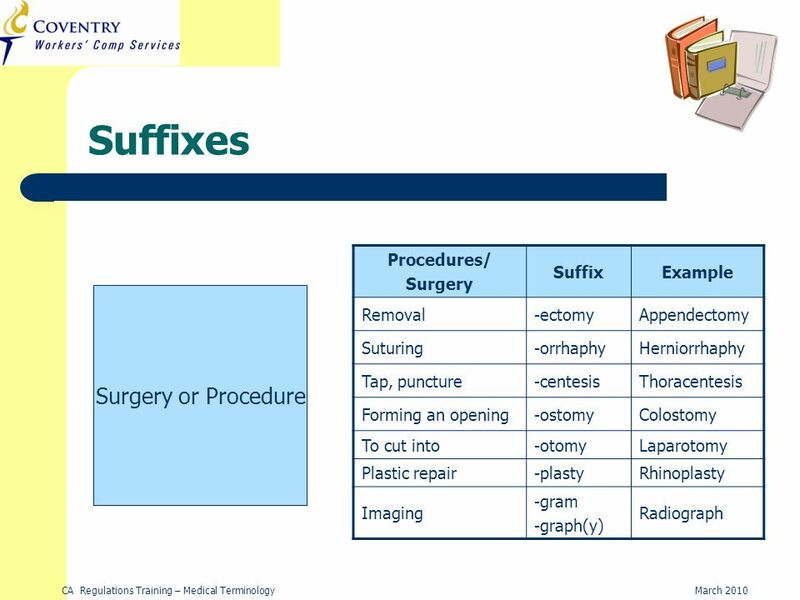 TERMINOLOGY SUFFIXES Heather Wipijewski CVT ALAT This workforce solution was funded by a grant awarded under the President’s Community-Based Job Training. 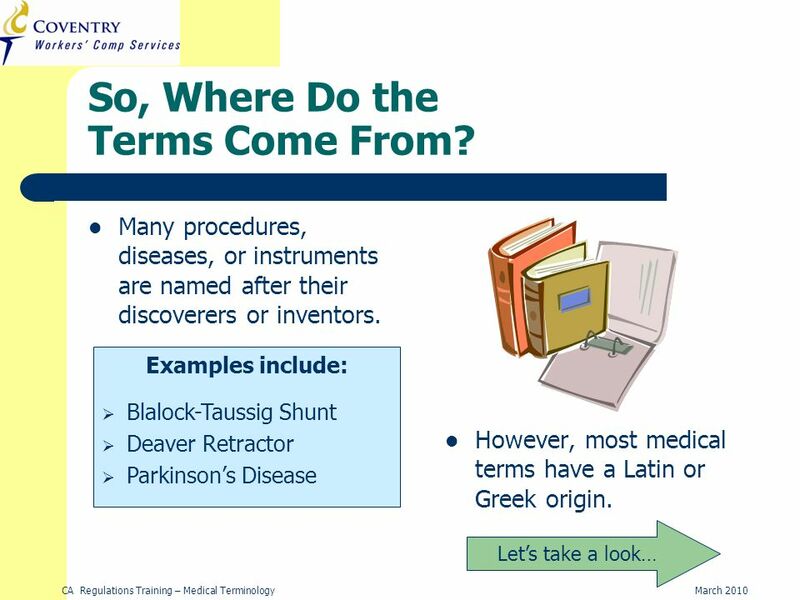 MEDICAL TERMINOLOGY The Language of the Health Profession.